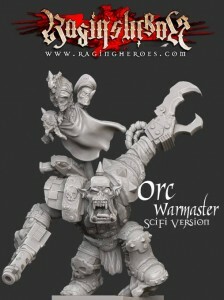 Raging Heroes listens to their customers and has updated the look of their upcoming SciFi Orc Warmaster. Based on the many comments we've received about our big SciFi Orc Warmaster, it looked like many of you wanted an additional weapon in the shape of a massive hydraulic pincer. Your wish is our command as you can see on the images below!